Santa Rosa voters are on their way to rejecting a widely-backed ballot measure that would have funded affordable housing. As of 1:40 a.m., with almost all precincts reporting, Measure N is short of the two-thirds majority required to pass, with less than 60 percent support. The $124 million bond was introduced in response to a housing crisis made worse by last October's wildfires. 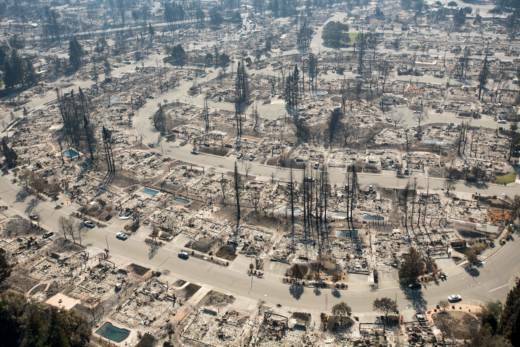 Santa Rosa lost five percent of its housing stock in the Tubbs Fire. Endorsements for Measure N ran the gamut from developers to environmental groups to the entire Santa Rosa City Council. But the North Bay Labor Council, which represents 70 unions, opposed it, arguing it didn't include enough labor protections for construction workers. Santa Rosa lost five percent of its housing in last October's Tubbs fire, putting a squeeze on an already tight housing market. One way the city is trying to fix that is with a bond on the November ballot to fund affordable housing projects. Measure N would tax Santa Rosa homeowners $29 per $100,000 of the assessed value of their home. The city estimates this would cost the “typical” homeowner there around $110 annually. Endorsements for Measure N run the gamut from developers to hospitals to the entire City Council. But the North Bay Labor Council, which has 70 member unions, has opposed the measure. Executive Director Jack Buckhorn said that's because Measure N doesn't provide enough worker protections, like requiring 30 percent of workers involved in the building projects to be skilled labor and part of a union. Councilmember Jack Tibbetts, who introduced Measure N, defended his choice not to include those protections during an August City Council meeting. The need for housing is so great members of Teamsters Local 665 actually voted to endorse Measure N — going against the stance of the North Bay Labor Council that they're a part of. At least a dozen of their members lost their homes in last October's wildfires, and the immediate need for housing relief simply outweighed concerns over labor protections. Mayor Coursey said he chose to endorse it for largely the same reason.